These species consists of the sensory pits on either side of the head that can sense heat easily. This special adaptation also helps them to identify any warm-blooded target even when it’s dark. 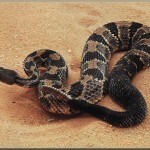 Although devoid of ears, the poisonous rattlesnakes can hear any kind any kind of sound. This helps them to identify the size and distance between them and the target with the direction as well. If any kind of vibration occurs, the rattlesnake produces a humming sound. They have a strong smelling sensation. The nature of rattlesnakes is very timid so they do not harm anyone unless irritated. In the period of winter, one can spot clans of rattlesnakes hibernating inside the dens. 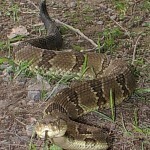 West Virginia has honored timber rattlesnake as their state reptile in 2008. These species drink adequate gallons of water equivalent to the weight of their body. Length of Timber Rattlesnake: This is amongst the largest snakes found In the USA. The length of these species varies from 91 to 137 cm. 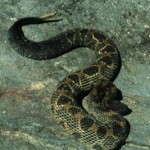 Weight of Timber Rattlesnake: The snakes’ weight depends completely upon their diet. They more they eat, the greater becomes their weight. These snakes are therefore heavier in areas where food is found in abundance. Color of Timber Rattlesnake: The timber rattlesnakes are usually found in two colors during their life span. Initially they are found in light yellow or grey color, which is called the light stage. In this situation, the background is decorated with v shaped black or dark brown color bands. The next stage is the dark stage where the yellow portion is decorated with thick black or dark brown bands that go across. 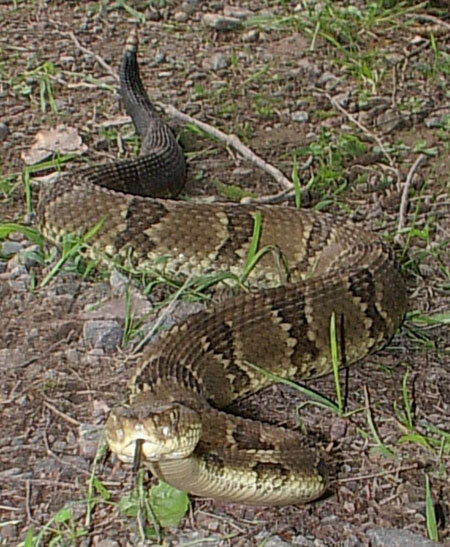 Head of Timber Rattlesnake: These species consists of a triangular shaped head that is broad and flat. Eyes of Timber Rattlesnake: Like all other poisonous snakes, the eye of timber rattlesnake comprises of the vertical incision. Tail of Timber Rattlesnake: The tail of timber rattlesnake is black in color. 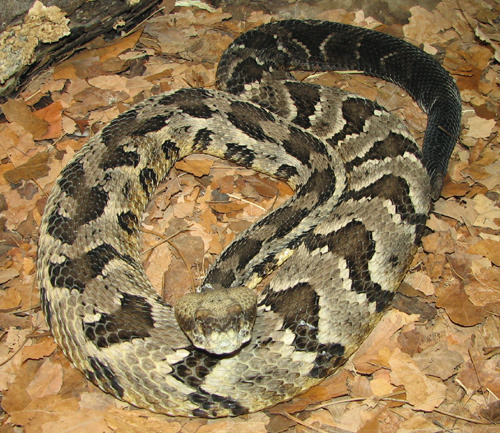 Skin of Timber Rattlesnake: The skin appears to be too rough due to the presence of scales. Sensory Organ of Timber Rattlesnake: These species have sensory openings, sensitive to temperature on either sides of their face. 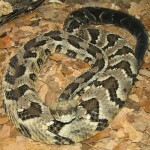 Rattle of Timber Rattlesnake: One of the unique characteristics of this snake is the rattle. The rattle consist of hornlike sections that are attached in a loose way. These species inhabit the eastern parts of the USA extending from South Minnesota, South New Hampshire to East of Texas and northern Florida. They also dwell in certain parts of the South Ontario and Canada. 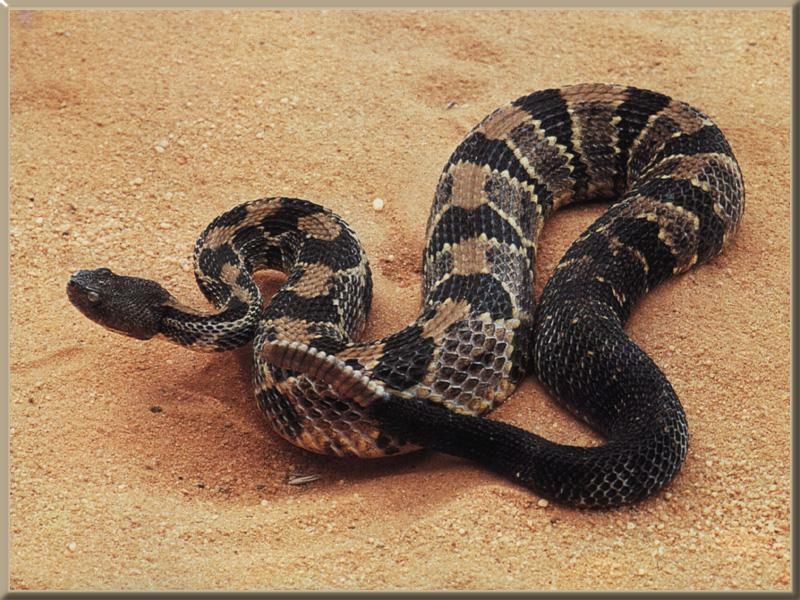 The Timber rattlesnake likes to have mammals like rabbits, chipmunks, moles, mice and weasels in their diet. These mammals comprise the main portion of their regular foods. This does not mean they do not feed on other mammal. They also like to have reptiles, birds and amphibians as well. These species like to remain active during the nights. Infact, they have great affinity for the new moon. They have an outstanding ability to sense the size of its prey. Moreover, they can also detect the direction. They have a tendency to pretend behind the rocks and all of a sudden, they swoop on the prey. If the rattlesnake understands that, the size of their enemy is bigger then these species prepare to attack suddenly. As soon as the species caught hold of the prey, they attack with the help of their poisonous teeth. The effect of the poison is so dangerous that the prey cannot move. After this, the snake gets ready to digest the prey. In order to digest the initial meal this species raises their body temperature to 80 to 85 degree Fahrenheit. Infact, the poison is one kind of secretion that helps to digest the food in a proper way. One can easily catch a glimpse of these snakes on the rough terrain of the deciduous forests. The males & females like thick woodlands. They also like to have hot & humid temperatures. The pregnant females prefer to rest on the bare rocky ridges where the temperature i9s very high. The pregnant females are called basking knolls. As they like to bask in the scorching heat of the summers prior giving birth. In case of males, sexual maturity is attained at the age of 4, while the females are sexually matured by the age of 7 to 11.The best time for this breeding is between July and August. The males fight against each other to win the heart of the female counterparts. The females can restore the fertilization of their ova for about 9 months. The males have a good capacity to store the sperms for several months. The female snakes usually involve in reproduction once in every 3 – 4 years. Over all they give birth to 6 – 14 juveniles during their lifetime. When born, the younger ones are wrapped in a thin membrane and they are a maximum of 8 to 10 inches in size. In addition to this, the younger ones have active fangs and poisonous glands. At this stage, females abstain from having food. However, she needs to be perfectly okay to meet all kinds of need of the younger ones growing in her womb. Therefore, the female snake needs to maintain adequate body temperature. The human beings find it very easy to capture the female snakes during the period of pregnancy. In this situation, they are easily trapped in the loop. These species can live up to 20 years of age. 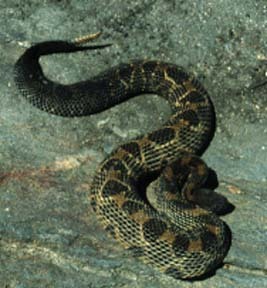 If any human being suffers a bite from the rattlesnake, the person should remain serene and quiet .It is necessary on the part of the victim to consult the doctor at the earliest. In such a situation, if a person gets too hyperactive, then the heartbeat accelerates. This results in a fair chance for the poison to disseminate in the whole body through increased circulation. In the last few years, these species have entered the list of those threatened. Human beings and their habitat are devastating their lives.